WE’VE GOT an apartment here in Bangalore now – just off the 100 Feet Road – which as several have noted here, describes the width of the road. It doesn’t describe the volume of traffic or the decibel level. Anyway, this here apartment has got Airtel wi-fi. It only seems to work between the hours of 4AM to 8AM, so it’s just as well there’s loads of mad birds round here that wake you up before there’s even a glimmer of light. We called the engineer in. He tested the line. The line, he explained, is fine inside the building, but there’s a problem with the copper outside. He is going to send another department round to check on the copper outside. Copper, of course, is Brit slang for a policeman. We think this wi-fi copper works a long long day, and it’s only when he goes off duty, between the hours of 4AM to 8AM that the Internet is allowed to work. This copper is keeping his eyes peeled and stops net access at all other times of the day and night. 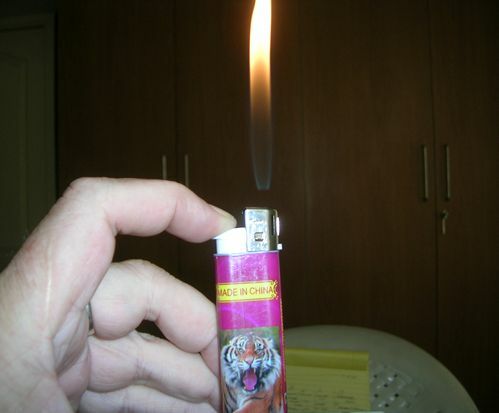 * In other Bangalorean news, we bought a lighter from the local Lakshmi Stores. This is an excellent lighter, adorned with the legend made in China. When it sparks, it produces a virtual flamethrower of a fire, and, here’s what’s unique about it. It doesn’t go out! It is an everlasting lighter until the gas runs out. This entry was posted in Uncategorized and tagged Airtel, Bangalore, copper, lighter. Bookmark the permalink. What you have there is an Olympic lighter. You’re supposed to run down the road holding it aloft while dressed in a singlet. It’ll burn for the next week or so, and then a man in a peaked cap will put it out on a passing monk. :) Picture added to post….